Description of "Mind of An Entrepreneur Today (eBook)"
Entrepreneurship is most often then only option for those in marginalized communities. They can introduce products and services and employ members of their communities. A surge in entrepreneurs can change the moral fabric of the world. Being an entrepreneur or independent can offer more personal security, more employment opportunities and maintain the energy flow of money both in the economy and in individual pockets. The process of becoming an entrepreneur and even a wealthy entrepreneur is a process that everyone should experience. This ebook is designed to help entrepreneurs and emerging leaders to discover their authenticity and to develop the mind of an entrepreneur today. I am an Effective Business Leader, Entrepreneur and Global Thought Leader with exemplary management, organizational and strategic thinking skills and a proven record of accomplishments in initiating and managing change, project management, process improvements, crisis management, contract negotiations, financial reporting, auditing and internal control analysis and a demonstrated ability to implement decisions and achieve corporate goals. I began my formal career with Price Waterhouse Coopers (PWC) and worked as an Independent Business Consultant and Project Leader that has trained thousands of entrepreneurs and emerging leaders; managed and developed over $200 million in Projects and Businesses. As a little girl I dreamed of owning my own business and providing opportunities. I would go to school and in my mind, I’d pretend that school was my business. I always saw myself as a business woman. My current industry experiences are vast including Entertainment, Healthcare, Insurance, Government, Investment Banking, Retail, Real Estate and more. 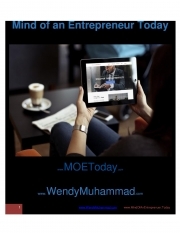 Reviews of "Mind of An Entrepreneur Today (eBook)"